David Walker was born at Great Clarendon Street, Oxford in 1860 and baptised at St Paul's Church on Whit Sunday that year. 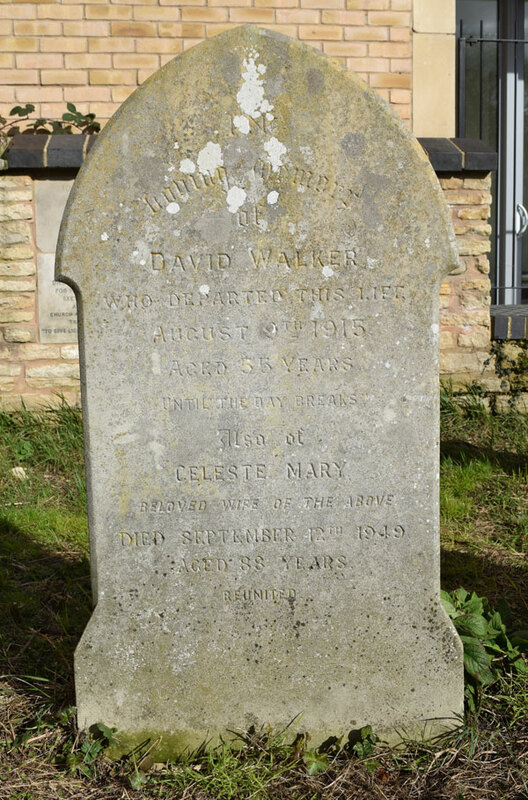 He was son of David Walker senior and his wife Hannah Hoar, who were married at St Thomas's Church on 12 June 1859. At the time of the 1861 census David, aged eleven months, was living at 18 Jericho Gardens with his father David Walker senior (22), who was a labourer, and his mother Hannah (20). His two younger sisters were born after that census and were also baptised at St Paul's: Mary Anne Walker in 1862 and Kate Edith Walker in 1866. David's mother Hannah died at the age of 32 and was buried in St Sepulchre's Cemetery on 10 March 1869 (St Paul ref. F.22, grave not identified). In 1871 David (10) and his sisters Mary (8) and Kate (6) were living with their father David Walker senior, a widower of 32 who was now working as a railway porter, in the home of their grandparents William and Catherine Walker at 42 Great Clarendon Street. In 1881 David's father was still a widower and working as a printer's warehouseman and living with his two daughters in the home of his brother William at 13 Cranham Street, while David junior (20), who was described as a printer but was probably a printer's warehouseman at Oxford University Press, was lodging with the parents of his future wife. Celeste Mary Nicholson was born in Halifax, Yorkshire on 11 April 1861 and baptised at St John the Baptist Church there on 19 May). She was the daughter of Richard Nicholson and Sarah Harriet(t) Turner, who were married at St Martin-in-the-Fields Church, Westminster on 16 October 1849. For more about her parents and three older brothers and her early life, see the adjacent grave of her parents. Celeste Mary Nicholson Walker (born in Oxford in 1904). David and Celeste Walker settled at 2 Leckford Road after their marriage, and their five children were born there. Their second child, and the first of their two daughters given the name Celeste, died as a baby on 6 March 1887, six months after her grandfather, and was buried in his grave three days later: see adjoining grave. In 1891 David (30) and Celeste (29) were living at 2 Leckford Road with their two surviving children Lydia (8) and Garnet (3). In 1901 David (40), still a printer's warehouseman, and Celeste (39) were at that address with their three surviving children: Lydia (18), who was now a lady's maid; Garnet (13); and Florence (8). Their youngest child was born in 1904 and given the name of her deceased sister Celeste. They were still at 2 Leckford Road in 1911 with Garnet (23), who was a collotype printer, and Celeste (6). Their daughter Lydia (28) was now the parlourmaid of the Forrest family in Iffley Turn, while Florence (18) was a servant at The Chanter's House, Ottery St Mary, Devon. 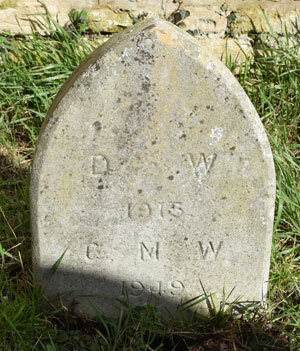 † David Walker died at 22 Southmoor Road at the age of 55 on 9 August 1915 and was buried at St Sepulchre’s Cemetery on 12 August (burial recorded in the parish register of St Paul's Church). As Southmoor Road is not in St Paul's parish, this plot was probably reserved by the Nicholson and Walker familes back in 1886. On 13 February 1919 at St Margaret's Church, Garnet David Nicholson Walker (31) of 22 Southmoor Road married Lizzie Roberta Wright (32) of 79 Kingston Road, the daughter of the deceased dairyman Frederick William Wright. On 22 May 1926 at St Margaret's Church, Celeste Nicholson Walker (22), described as a maid of 79 Kingston Road, married Albert Arthur Holtam (23), an engineer of 107 Clarence Street, Rotherhithe and the son of the engineer Albert Richard Holtam. † Mrs Celeste Mary Walker née Nicholson died at 22 Southmoor Road at the age of 88 on 12 September 1949 and was buried at St Sepulchre’s Cemetery on 15 September (burial recorded in the parish register of St Paul's Church). Lydia Sarah Harriet Walker (born 1882) may be the Lydia S. H. Walker who died in Newcastle at the age of 78 in 1983. Garnet David Nicholson Walker (born 1887) and his wife Lizzie do not appear to have had any children. Garnet was living at 79 Kingston Road when he died at the Churchill Hospital, Oxford at the age of 66 on 12 May 1954. His effects came to £1,883 17s. 6d., and his executor was the lithographic printer Benjamin Davey. Florence Hannah Nicholson Walker (born 1892) is hard to trace after 1911, which suggests that she did not marry and died after 1983. Celeste Mary Nicholson Walker, Mrs Holtam (born 1904) and her husband Albert Arthur Holtam had two children: Celeste M. Holtam (born in Bromley in 1927) and June A. Holtam (born in Uxbridge in 1936). Celeste's husband died in Newcastle under Lyme in 1960 at the age of 58, and she herself appears to have lived beyond 1983.